This book defines the concept and practices of literacy through a discussion of knowledge, information media, culture, subjectivity, science, communication, and politics. Examining the ways in which the spread of literacy and education have caused culture wars in pluralist societies since the 16th century, the author reviews an interdisciplinary array of scholarly literature to contend that science, and more broadly evidence-based inductive arguments, offer the only reliable source information, and the only peaceful solution to cultural conflict in the 21st century. With a focus on the multifaceted practice of literacy-as-communication as embedded within larger social and political processes, this book offers a comprehensive study of literacy through five core topics: knowledge, psychology, culture, science, and arguing over truth in pluralist democracies. The central thesis of the book argues that we require a new literacy that incorporates reading and writing with advanced cognitive and epistemological skills. Today’s citizens need to be able to understand the basic cognitive and cultural processes through which knowledge is created, and they need to know how to evaluate knowledge, peacefully debate knowledge, and productively use knowledge, for both personal decisions and public policy. How Do You Know? The Epistemological Foundations of 21st Century Literacy is an interdisciplinary study that will appeal to scholars across the sciences and humanities, especially those concerned with pedagogy and the science of learning. 4. Discontent with Democracy: Culture Wars in U. S.
J.M. Beach is a lecturer with the University Writing Program at the University of Texas, San Antonio, USA. He has advanced degrees in the fields of English, History, Philosophy, and Education, and has taught students in the United States, South Korea, and China. He is the Director of 21st Century Literacy; a non-profit organization focused on literacy education, and is also a poet. His research interests focus on the philosophy of knowledge, the science of culture and society, the history and philosophy of education, and literature. Some of Beach’s previous books include What Is Education? On the Social Ecology of Teaching, Learning, and Schooling (2014), Gateway to Opportunity? A History of the Community College in the United States (2011), Children Dying Inside: Education in South Korea (2011), and Studies in Poetry: The Visionary (2004). Visit the author’s website at www.jmbeach.com. "The ability to learn and reason is badly taught in our public schools, and deserves a radical upgrade. The pathway for this crucial improvement is clearly marked out in Beach’s How Do You Know?" Edward O. Wilson, University Research Professor Emeritus, Harvard University. "Beach outlines the kind of curriculum that has long been needed to clarify the mysteries of intellectual culture, a culture that otherwise will remain a secret society reserved for the few. It won’t help students much to learn masses of factual information unless they learn "how to use" that information, which for Beach (drawing on the important work of psychologist Deanna Kuhn) means being able to use what they know to make arguments, which includes assessing the arguments of others. This argument literacy lies at the core of Beach’s proposed critical thinking curriculum for the 21st century, and nobody I know has said all this better than has Josh Beach in this book." Gerald Graff, Emeritus Professor of English and Education, University of Illinois at Chicago, and 2008 President, Modern Language Association of America. "A giant step towards a comprehensive theory of literacy that would help to explain its role in the shaping of mind and society." David R. Olson, University Professor Emeritus, Ontario Institute for Studies in Education, University of Toronto . "Beach forges a wide and studious path across much of philosophy, science and psychology in an effort to answer the question of how we can know. His answer -- to commit to open argument, grounded on values of truth and freedom -- doesn't resolve all concerns. But I agree that it is the best one we have, and today's world makes it more urgent than ever that we embrace it." Deanna Kuhn, Professor of Psychology and Education, Teachers College, Columbia University. "This is a book that calls for a wide readership – basically, anyone interested in the role of critical and rational thinking in a democratic society, the compelling need to teach individuals to make discerning evaluations of the array of information encountered, and the importance of understanding the premises of scientific theories, methods, and empirically grounded claims. 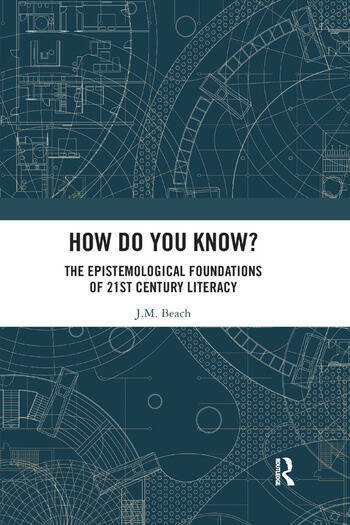 Providing a sweeping (and deeply engaging) historical, philosophical, and cultural context for his argument, Beach makes it clear why an expanded definition of literacy must include a focus on how we know what we know, what psychologists call epistemic cognition. Such a definition of 21st century literacy would be an invaluable one for the muddled and complicated times in which we are living. Seldom is a book of such scope and depth so imminently readable and engaging." Barbara Hofer, Professor of Psychology, Middlebury College. "Beach helps us understand how in a pluralistic society we got to culture wars, alternative facts, the era of post truth, spin and fake news and how to develop an interdisciplinary approach to knowing, judging wisely and acting skillfully. He explores the relationships amongst subjectivity, biology, culture and the objective world. Since we can’t trust our subjectivity, our biological brains, cultural influences, authority, or the news, Beach asks what do we do? How do we distinguish sophistry from truth? For practical, critical thinking to succeed, it needs to incorporate the foundational elements of science: empiricism, rationality, and open debate. Beach proposes that to have respectful democratic deliberations, we need an education that helps us critically understand and evaluate our knowledge and premises about value, offering a way to knowledge and out of our divisiveness." Robert Frank, Professor Emeritus of English and Associate Dean of the College of Liberal Arts, Oregon State University. "This book makes a critical intervention into a very old problem: what does it mean to be an ‘educated’ person, to be a citizen in the classical sense? Working in a vein that stretches back from Richard Rorty through John Dewey to Horace Mann, Josh Beach offers pragmatic solutions to the question posed by The Uses of Literacy for 21st century Americans." John Cline, Lecturer in Engineering Communication, Department of Mechanical Engineering, University of Texas at Austin.